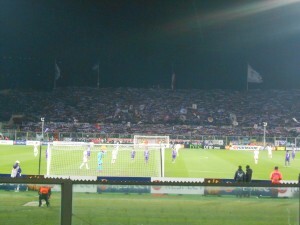 The crowd at the Fiorentina and Tottenham game in the Round of 32 in the Europa League game. This photo was taken towards the end of the game when Fiorentina had a 2-0 advantage over Tottenham. You can see the happy Viola fans waving their scarfs and flags. My first month in Italy has come to a close and it has been quite the experience so far. As a history major, Florence is the place of my dreams. Every building has historical significance from the mighty Duomo to the small chiesa where Dante once preached. Back home you had to drive quite some way to go to a museum or anything like that. Here there is probably a museum every few blocks with artifacts not just important to the culture here but, all of Italy and even the world. The only problems I have come across is my sometimes comical lack of knowledge in the Italian language. Don’t get me wrong I studied Italian for three semesters at my home university (the University of Missouri, Columbia) and felt fairly prepared when coming here. However, sometimes I simply can’t understand what people are saying and don’t know how to accurately say what I am thinking. This usually isn’t a problem as a lot of people here are learning English, not everyone mind you, and a lot of people are extremely fluent in the English language. I have noticed though people seem to be kinder to you if you can speak even a basic amount of Italian, such as boungiorno, buonasera, perfavore etc. and placing a food order in Italian while using polite words is usually well received. My knowledge of Italian has been quite useful in places that are not especially catering to tourists and American students, such as small wine bars and asking someone on the street for something (usually directions as I constantly get lost). 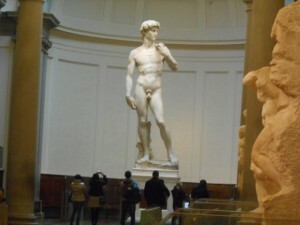 Michelangelo’s David at the Galleria dell’Academia. The most easily recognized work of art and Florence and possibly Italy. However, as I have said before I wish I was more fluent in the Italian language. There was one instance where my lack of confidence in Italian led to a very embarrassing incident at my expense. I was trying to simply buy a soda from a café. So I reached into the cooler and grabbed a can but, while pulling the beverage out from the cooler I must have bumped the can against something as immediately after I shut the cooler door cola began to shoot out of the can all over the floor and myself. Not knowing what to do I screamed “Aiuto!” inappropriately loud. Aiuto of course translates to help me. So, everyone in the café turns to me expecting some sort of actual emergency, only to find me juggling a can soda which is spraying all over the place. Their response was uncontrollable laughter, especially one very enthused young boy who proceeded to point and laugh at me until him mom smacked his hand down. Luckily, the staff of the café were so amused with my clumsy antics that they didn’t charge me for the soda I had broken. 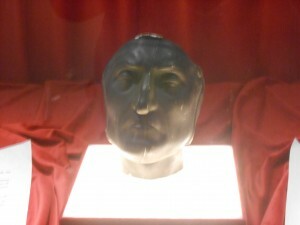 Dante’s death mask. The Florentine author of the Divine Comedy and some credit him for the widespread usage of the Italian language. The mask is currently held at the Casa di Dante museum in Florence. So far I have greatly enjoyed the cultural differences between USA and Florence. Being a soccer (calcio) fan in the USA meant being somewhat of an outcast when it comes to sports, here it is the exact opposite. I went into a bar to watch the Fiorentina game and the place was absolutely packed of loud compassionate supporters who wanted were there only to watch the game. This passion is kind of a two sided coin though. While it is great to finally have people passionate about the same things I am, perhaps the passion may be a bit more overzealous than I expected. In Rome there were riots during the build up to their game against Feynoord (a Dutch team from Rotterdam) and as a result the police force in Florence was greatly increased for Fiorentina’s game against Tottenham, a London based team. This increase was greatly noticed in the days leading up to the game as police presence was huge in certain areas of the city. However, this did not stop me from going to the game where I had the time of my life cheering on la Viola with the thousands of people in the stadium. Fiorentina won 2-0 and, as far as I know, there were no incidents of violence. 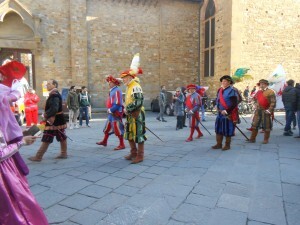 I was fortunate to be in Italy during a time of huge importance for the Italian people, not only Carnivale, which I experienced in Venice, Milan and Florence, but also the anniversary of the Siege of Florence by Charles V. The event was celebrated by a parade from Palazzo Vecchio to Santa Croce, where a game of Calcio Storico followed. Calcio Storico to me seemed a lot like rugby except on a smaller field and much more violent. Another thing I have been getting used to is city life. As I have lived my whole life in rural areas and fairly small towns, living in a city is totally new to me. As a result I frequently get lost but, it is ok as I have figured out a very loose system of finding my way around. Basically if I am lost I either ask for directions in the most polite manner I can or explore the city until I stumble across a land mark, usually a church or the Arno River which cuts through the city. Based off which church I find myself at I can usually find my way back to my apartment. I have also noticed that here in Italy it is much easier to travel by train than in the states. You simply get your ticket at the train station, hop on the train and off you go to anywhere you like. It is so much simpler than trying to rent a car or hailing a taxi. The ride on the train is also fairly smooth. 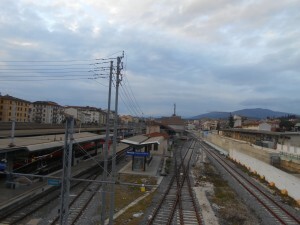 The more modern side of the city as seen from over the Campo Marte train station. One last thing I have noticed about Italian culture is the importance of small talk. In the States you simply go into an eatery order, take your food and leave. Here it is seen as polite to first have a brief conversation beforehand such as “Come stai?” usually followed by, “Bene e tu?” etc. Even with the minimal lingual ability I have, I have been able to have brief conversations with people I come into contact with on a day to day basis. Although, sometimes I lack confidence to say anything at all and simply stay quiet. I really hope that does not come off as rude but, I fear it does. I know with time and practice I will get better at navigating the city and speaking. Charles is a current student at the University of Missouri studying at Florence University of the Arts (FUA) in Florence, Italy during the Sprig 2015 term. Really enjoyed reading about your experiences of living abroad, Charles! You are amazing!